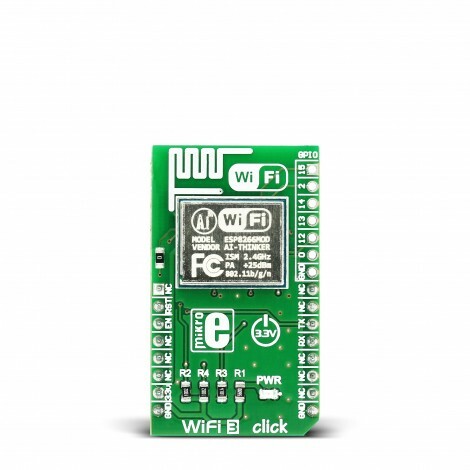 WiFi3 click is a complete self-contained WiFi solution carrying the ESP8266 module with a system on a chip. The click is designed to run on a 3.3V power supply only. 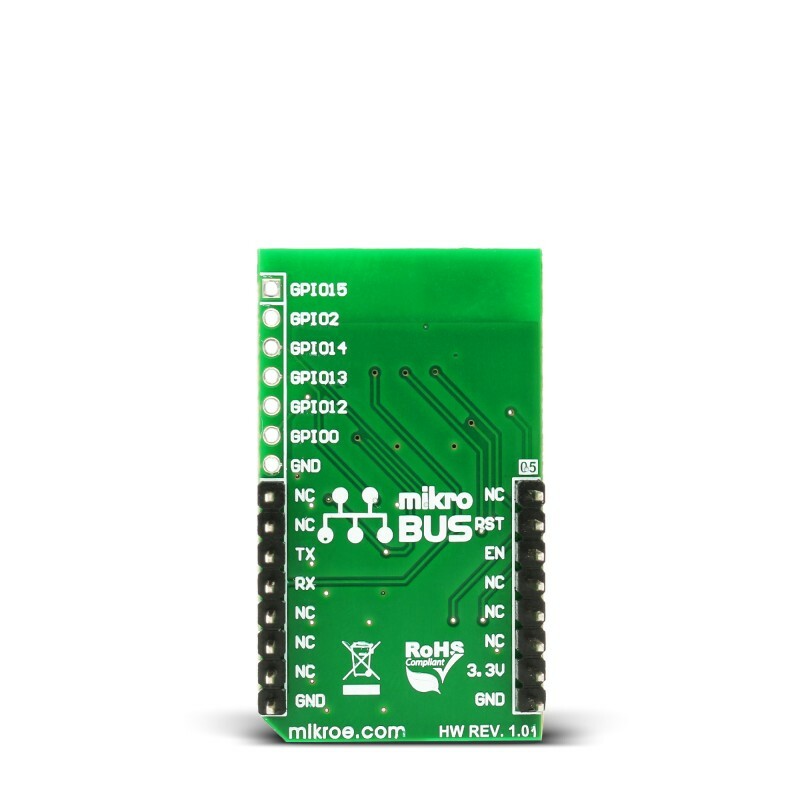 It communicates with the target board microcontroller through the mikroBUS™ RX, TX, CS and RST lines. The module supports standard IEEE802.11 b/g/n agreement and has an integrated TCP/IP protocol stack. It also integrates antenna switches, an RF balun, power amplifier, low noise receive amplifier, power management modes and more. The Standby power consumption of < 1.0mW is ideally suited for IoT projects and devices that need long battery life. 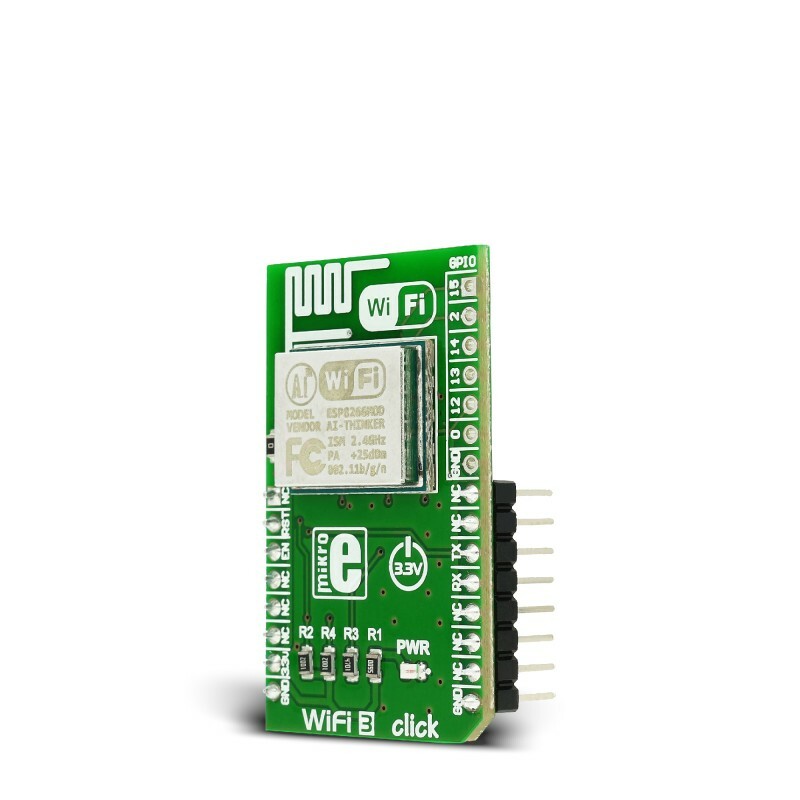 WiFi3 click is ideally suited for IoT applications. The System on Chip offloads all the networking functions from the MCU. 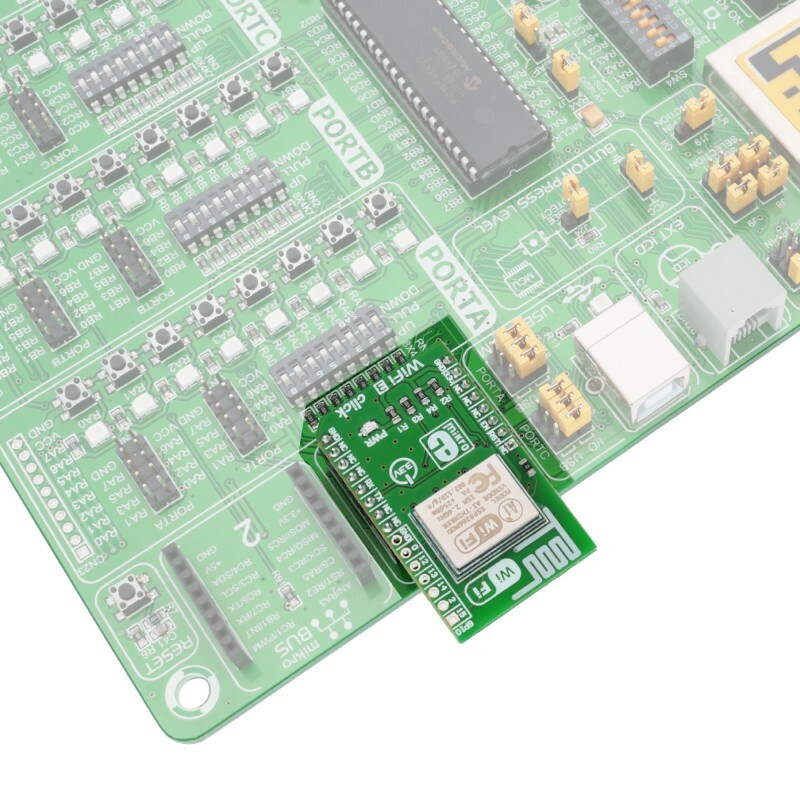 You can integrate it with sensors and actuators through its GPIOs and connect your things to the internet with minimum development effort. 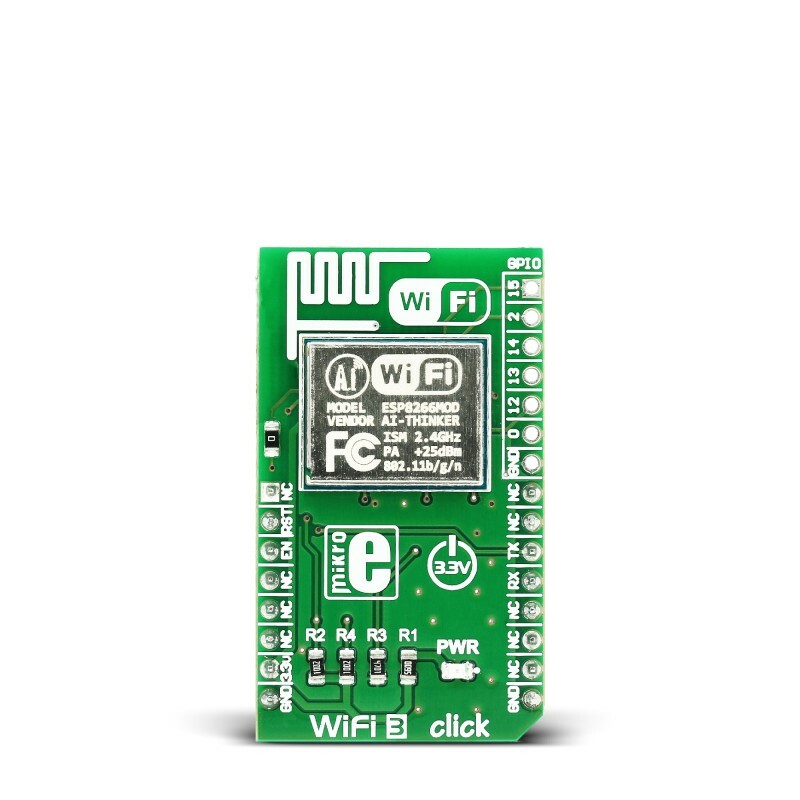 WiFi3 click features a PCB trace antenna, designed for the 2400–2483.5 MHz frequency band. This table shows how the pinout on WiFi3 click corresponds to the pinout on the mikroBUS™ socket (the latter shown in the two middle columns). Code examples for WiFi3 click, written for MikroElektronika hardware and compilers are available on Libstock. The following code snippet shows the interrupt routine for receiving characters from the WiFi3 module.